When TechnicolorMom and I first met, we talked about video games a fair bit. In time, we’d begin playing games together as long as there was some kind of cooperative experience for us to enjoy. One of the first games we played together was called Skylanders: Spyro’s Adventure. It was a game that had drawn my attention a bit when it released, but that I had largely ignored until I was visiting with TechnicolorMom in Nashville. We were at a Wal-Mart and they had lots of the characters from the first game. We picked up a copy for her Nintendo Wii and brought it home to give it a try. 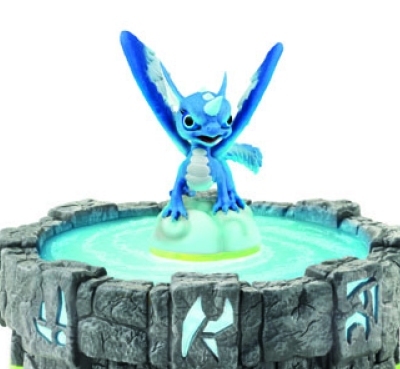 For anyone that has no clue what I’m on about, Skylanders was a console game that allows one or two players to “bring characters to life” by purchasing physical figures and then placing them on a device that loads them into the digital video game as playable characters. The game was designed primarily for children, with the imagination of these characters being teleported into the game through a portal. It was a “dungeon-crawler” game, which meant you mostly just run around spamming attacks against waves of enemies as you work your way through a level. Along the way you find secret items, upgrade your characters, and generally have fun. The games were money pits. It’s not hard to understand why the “toys 2 life” gimmick eventually fell apart. Collectors, children, and parents all rushed to the store to get these physical characters, which then piled up on the floor as new characters were released that were stronger, faster, or more exciting. For TechnicolorMom and I, though, the experience was impactful. I got to play my video game, but I also had a partner to play with me. She enjoyed the game’s art style and kid-friendly nature, which meant plenty of co-op time on the couch, and when we were bored of being at home, we could make an afternoon of going out on “hunts” at toy stores to find characters we hadn’t collected yet! Initially the franchise was booming! They ended up making six titles, one every year from 2011 through 2016. The last year we got a new entry was the same year our daughter was born. Along with the console games, Activision had tried their hands at a number of mobile games to coincide. We only ever really took to one called Skylanders: Lost Islands. Unfortunately, all of those were shut down throughout 2016 as the franchise completely receded from the market. I’m not usually one for mobile games. I have played a handful of them over the years, but never felt the draw of one to the point of bothering with micro-transactions or investing time that could be spent playing a real game. But then on February 27th, 2019, Skylanders: Ring of Heroes arrived on mobile. It’s a traditional “gacha” game, which is a popular game design for mobile. The term “gacha” is derived from “gashapon” or “gachapon”. These terms refer to coin-operated vending machines in Japan (and other nations) that typically offer up high-quality toys that are considered collector’s items, with rarities between the toys that can make some of them extremely valuable. Here in the United States of America, we often think of the coin machines that spit out cheap plastic knick knacks, but the gashapon toys are nothing so frivolous. The Skylanders franchise was already a physical form of the gacha mechanic, so the transition to mobile was quite efficient. TechnicolorMom and I where quick to fall back in love with our old characters, seeking out ways to collect their digital counterparts as we once did with the old console games. Having played for over a month now, I have only a handful of characters that I haven’t unlocked, and I’ve got plenty of work to do to slowly level and power up the characters I do have.